The Whanganui Journey is one of New Zealand’s Great Walks, however, it does not actually require any walking. 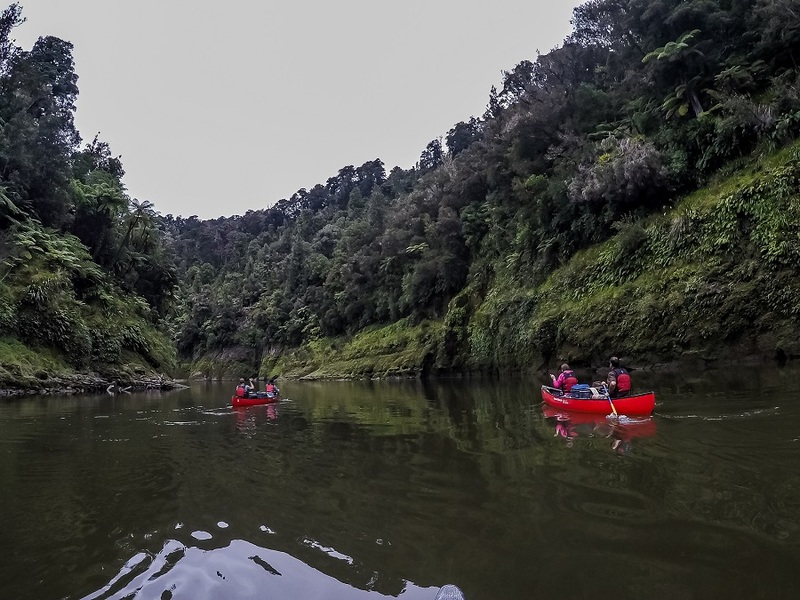 This canoe or kayak journey down the Whanganui River is great for groups of all ages and sizes. 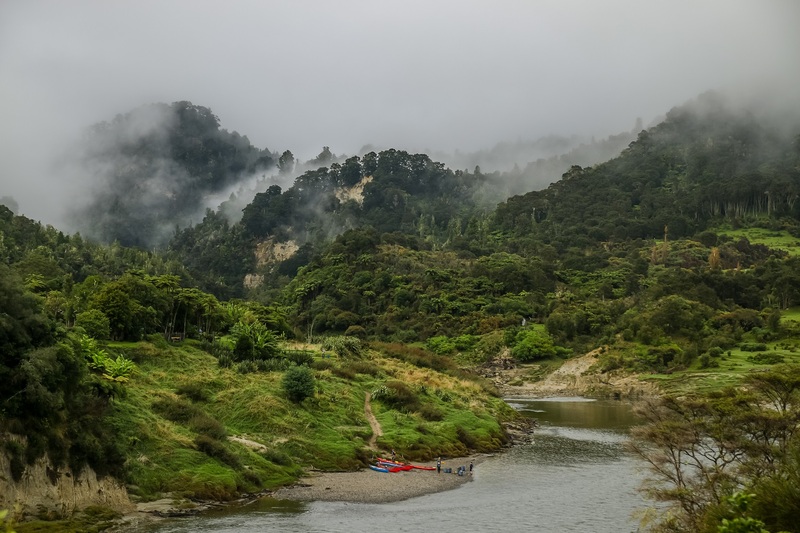 The Whanganui River carves through lush rain forest in one of the most remote locations in New Zealand. Cut off from civilization, the river cuts through deep gorges and stunning scenery. There are many campsites all along the river, which allow a trip between three to five days. 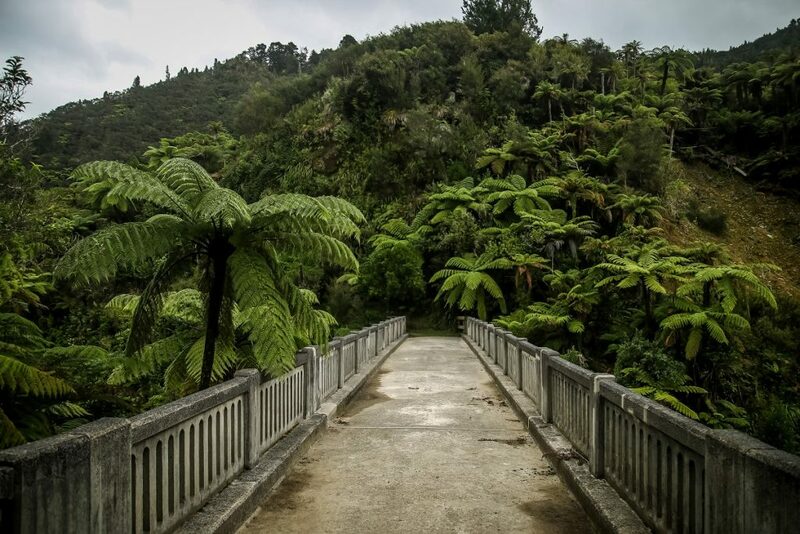 Located two hours southwest of Rotorua on the North Island, the Whanganui is in a dense rainforest sandwiched between Tongariro and Taranaki. With very few roads to access this river, kayak rental companies are location near Taumarunui and Whakahoro. The Great Walk season is from October 1 – May 1. During the season, the huts and campsites require prior bookings. In season, huts have cooking stoves and a resident hut warden. Out of season, huts are first come first serve with discounted rates (see How to Book for costs), some without cooking stoves. Campsites are all basic with a long drop toilet and shelter unless located near a hut. The Whanganui Journey can be done between three to five days. There are tours which can be extended up to ten days. 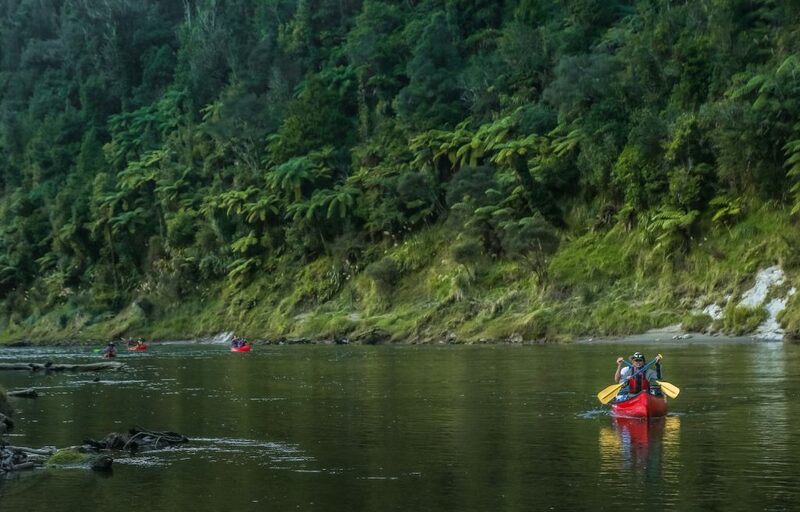 We recommend three days, which explores the best part of the river, starting in Whakahoro and ending at Pipiriki. For more details on hut locations, distances and maps, check out the DOC website for the Whanganui Journey. The Whanganui Journey will require booking in advance. A booking with a kayak or canoe hire is required, which comes with transportation to and from the river. Booking campsites/huts also must be done online prior to the trip. We recommend booking a trip with Taumarunui Canoe Hire. They are a family run company offering canoe and kayak rentals. We felt they provided some of the best service in all of New Zealand. They also give complimentary coffee/latte’s during the briefing and homemade cookies/cake on pickup which for us is a huge selling point. Contact Karen or Ron via email at [email protected] or by phone at 0800 226634. Booking a campsite or hut can be done online. During the Great Walk season, a hut costs $32 and a campsite costs $20 per person. Out of season costs are $15 for huts and $5 for campsites. There is also a private campsite across from Tieke Kainga, Ramanui, which costs $15 per night. Book a DOC campsite online and Ramanui can be booked directly with Taumarunui Canoe Hire. From Whakahoro to John Coull campsite. This day has the biggest change of scenery, going from a nice scenic river with surrounding hills into a deep canyon within the national park. Day three is the most scenic of the 3-day journey and in the heart of the national park. A little over 3 hours paddling from John Coull is the Bridge to Nowhere. Where there is a one hour walk into the bush to visit the famous Bridge to Nowhere. Finish the afternoon paddling to either Tieke Kainga or Ramanui campsite. The last day of paddling to Pipiriki is the shortest day but comes with the most excitement. This day has several rapids which are fun to navigate with a large chance of getting wet. It is filled with some hard paddling and is lots of fun. 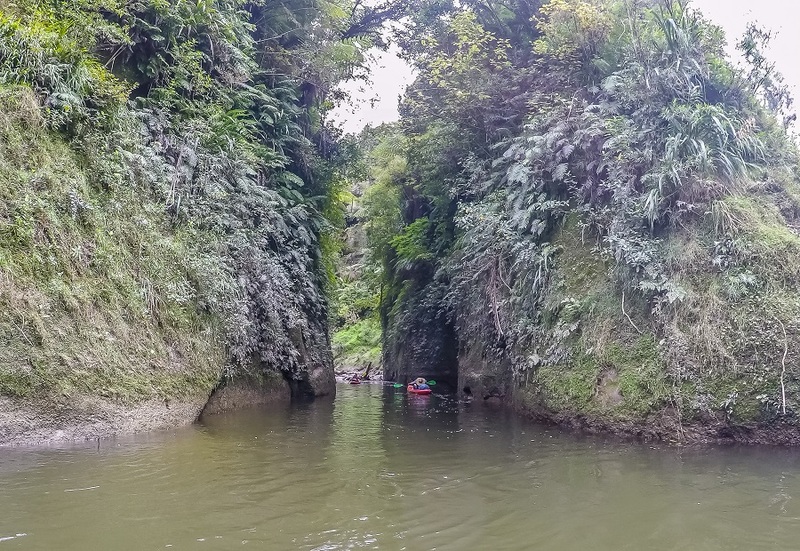 Jet Boat Tours to Bridge to Nowhere would be the best way to experience the Whanganui within the National Park and get a taste of the scenery in one day. Going to the Bridge to Nowhere takes you into the middle of the park and also will provide some interesting historical context to the region and bridge itself. 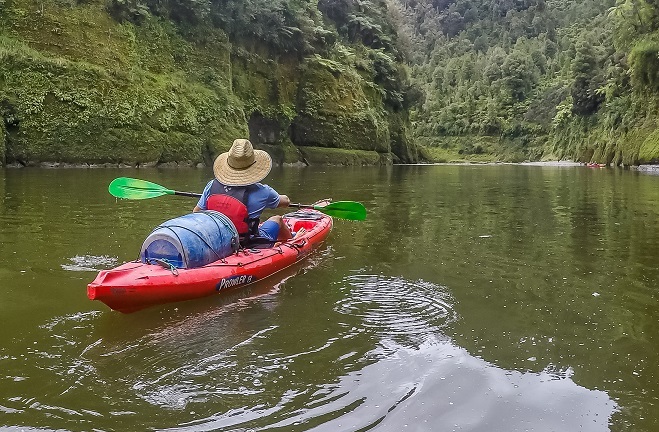 Tours cost from $135 with Whanganui River Adventures and typically last 4-6 hours. Rain occurs in this region often. Be prepared for rain at all times. There are several rapids that are novice rapids, but can still tip the canoe, especially towards the end of the journey. Be prepared to get wet with the potential to flip the canoe. Gas burners are available at all huts and available for use by tent campers. Water is available at each hut. Water is not filtered and you can filter/boil for your own precaution, however, hut water is almost always drinkable in New Zealand. A 60L barrel and five 30L barrels are provided for your gear. This is more than enough space for tent gear, clothing, food, drinks and all supplies.